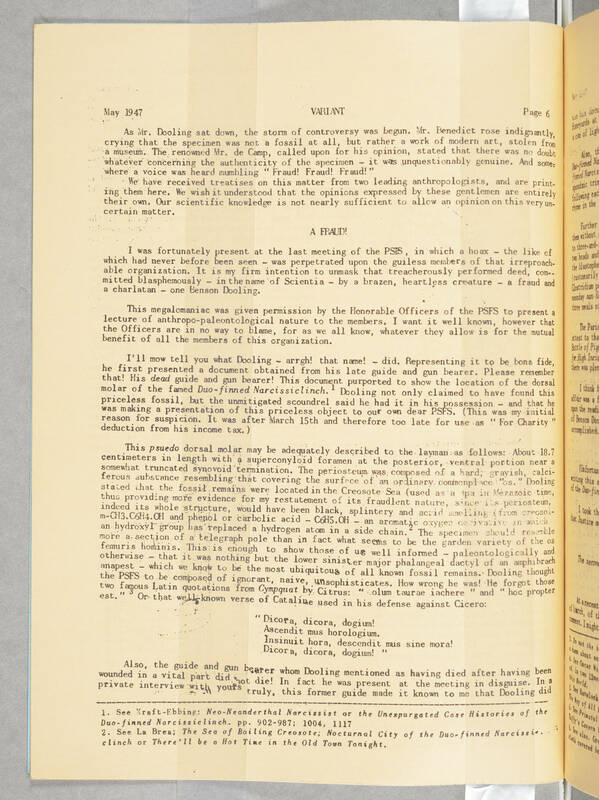 May 1947 VARIANT Page 6 As Mr. Dooling sat down, the storm of controversy was begun. Mr. Benedict rose indignantly, crying that the specimen was not a fossil at all, but rather a work of modern art, stolen from a museum. The renowned Mr. de Camp, called upon for his opinion, stated that there was no doubt whatever concerning the authenticity of the specimen - it was unquestionably genuine. And somewhere a voice was heard mumbling "Fraud! Fraud! Fraud!" We have received treatises on this matter from two leading anthropologists, and are printing them here. We wish it understood that the opinions expressed by these gentlemen are entirely their own. Our scientific knowledge is not nearly sufficient to allow an opinion on this very uncertain matter.